We recently got a chance to visit LEGOLAND Florida and stay at the new LEGOLAND Hotel. It was a blast! I just love everything LEGO. While there we checked out the construction for the new Heartlake City area coming to the park. It will be based on the highly successful LEGO Friends line of toys and is scheduled to open later this summer. The signs on the construction walls say it will be opening June 26th, but I find that hard to believe based on their current construction progress. Still, it looks like the new spotlight attraction for area, Mia’s Riding Adventure, a crazy looking disc coaster, is just about ready. (See this video of the ride already open in LEGOLAND Windsor.) Nothing else for the area seems ready as of yet though. Check out the construction pics below. Aerial view of the new area taken from the Island in the Sky ride. It looks like they’re connecting more of the existing Cypress Gardens area, on the left into the new land, on the right. I leave you with a crazy LEGO kangaroo trying to chainsaw down the building! That’s all for this LEGOLAND Florida update! Would you like to see more updates from LEGOLAND? 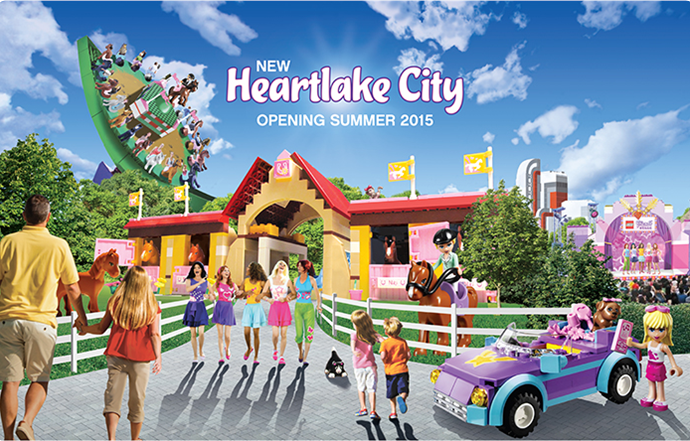 Will you be visiting Heartlake City when it opens, whenever that may be? Be sure to subscribe to the feed for more theme park news and updates! And check out my recent video and pictures from the new Raptor Encounter at Universal’s Islands of Adventure of you haven’t yet!